During a school break, Sarah needed a ride home. Joseph offered to give her one. That week, he continued making himself available for taking Sarah and her friends to the mall, out to dinner and the movies. Their conversations in the car made Joe consider how similar he was to Sarah. Meanwhile, she’d begun realizing how different they were. Despite their initial differences, their friendship grew through studying together, spending time with their mutual group of friends, service, and Joe’s encouragement that Sarah attend the daily 6:00 A.M. Mass at their parish. After Mass one day, Joe told Sarah, "I can see myself marrying you." He asked if he could date her with the intention of discerning marriage. Their discernment led them to entrust their relationship to Mary and grow both individually and as a couple. 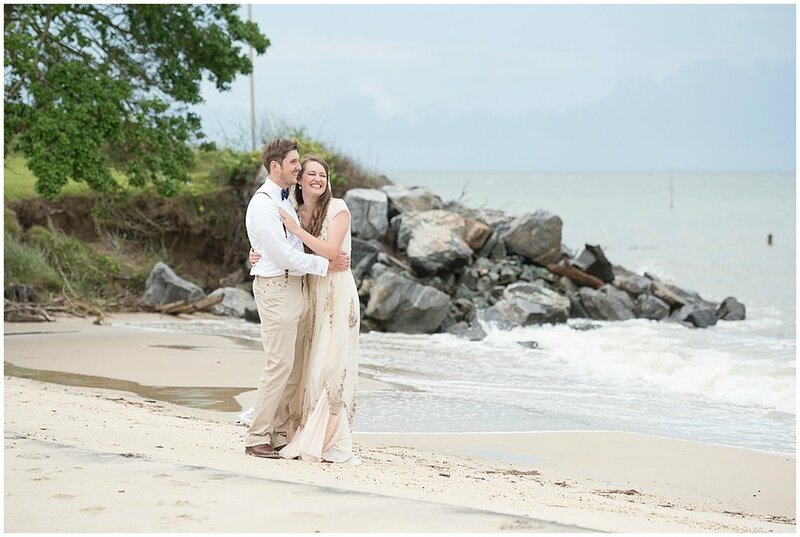 After an elaborate all-day scavenger hunt, Joe proposed during a boat ride on the Chesapeake Bay. Out on the water, he pulled out a letter and a ring. He read the letter and asked her to marry him. From the Bride: Family is a huge part of our lives, and it’s a big part of what marriage is about. Every marriage gives birth to a new family. We are both from large families-- I’m the oldest in my family, and Joe is the youngest in his. 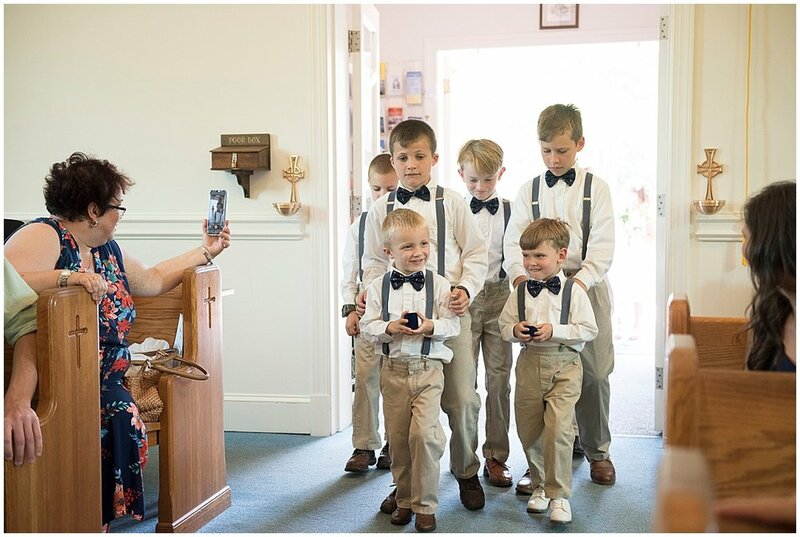 We wanted to highlight the beauty and vocation of family through our wedding, so we invited our siblings to process into the church in groups. One of my favorite memories from the day is being driven to the church in the big old family 15-passenger van! I brought all six of my sisters, my mom, and a close friend to the bridal store where I found my dress. After narrowing down a couple choices, I couldn’t make up my mind between a classic white dress and this beautiful bohemian dress. I decided to sleep on it and send a picture to my future mother-in-law. 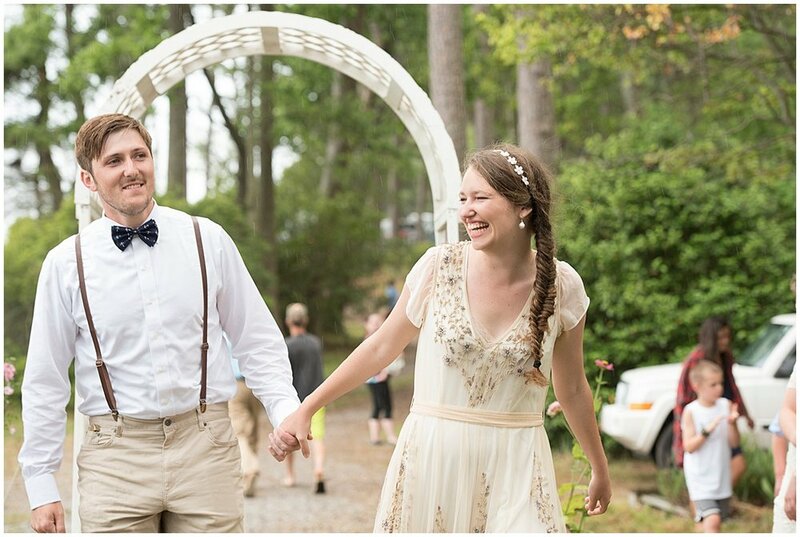 She responded with the question, “What dress makes you feel beautiful?” I picked the boho dress. 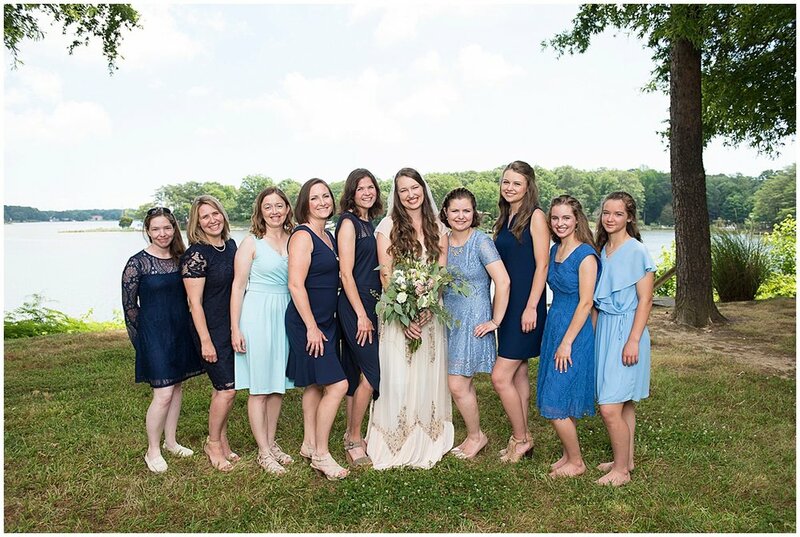 Because the dress was so unique, we decided to keep it a big secret amongst the sisters and moms. 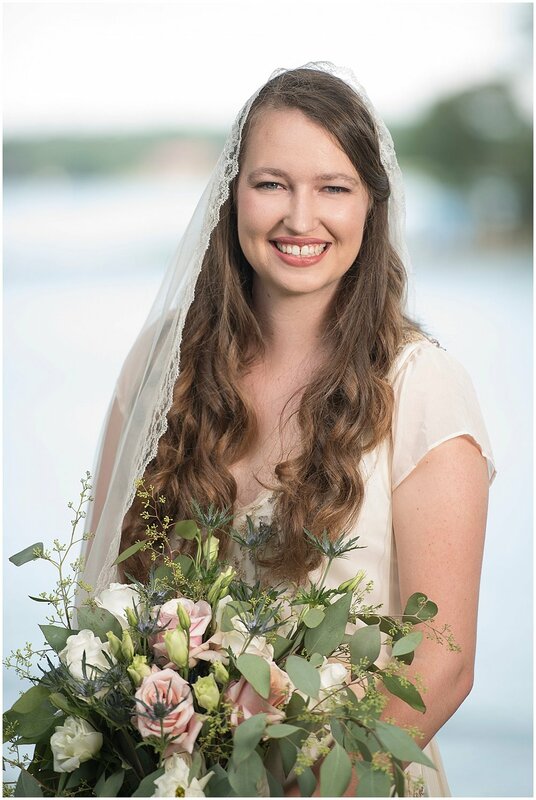 My grandmother passed on to me a family veil worn by her, my mother, and my great-grandmother wore. My aunt graciously transferred the handmade lace to a chapel length veil. It was quite the family effort. 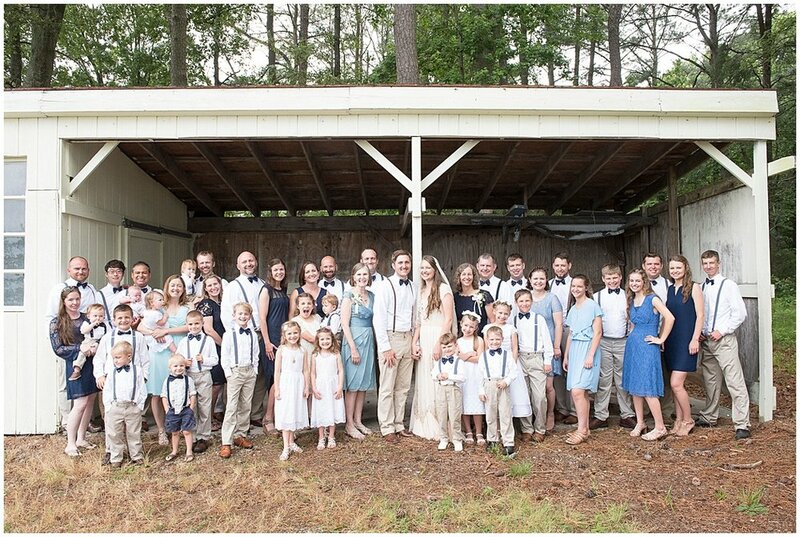 For our family wedding party, I chose a few shades of blue and encouraged everyone to buy attire that suited him or her. 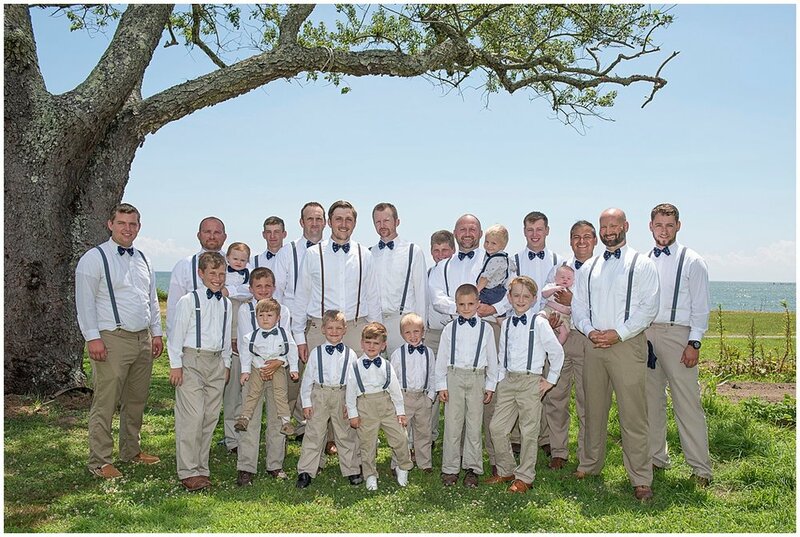 We chose the guys’ anchor bowties and suspenders because they fit well with what we love: blue water, sky, and boats! 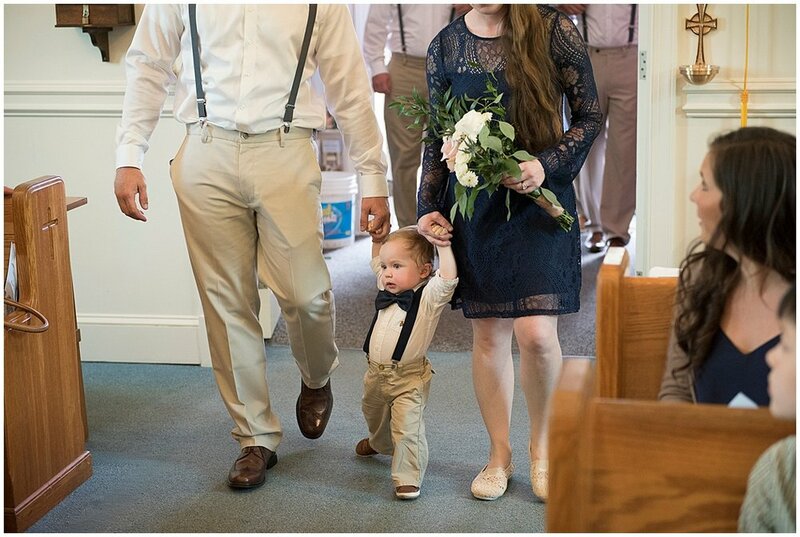 The Mass was filled with flower girls and little boys in bowties. Joe’s goddaughter carried a crucifix we said our vows over. It now hangs in our bedroom, a daily reminder of the vows and cross we carry. Joe's father passed away a few months before our wedding. 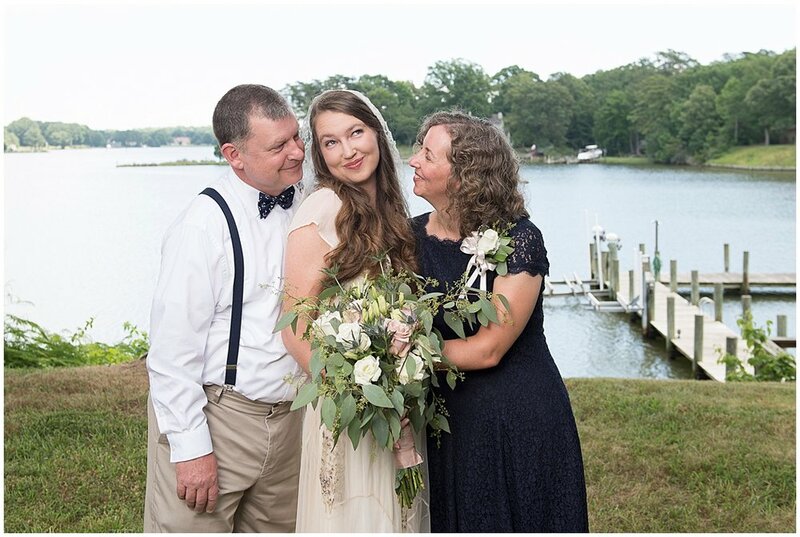 Our wedding date was on Father’s Day, a special gift from our Heavenly Father and it made us feel Pop was there in a distinct way. On the back of our wedding program, we placed a picture of Pop holding hands with his wife: a nod that marriage is until death, pointing us to the eternal love in Heaven. Our prayer for our nuptial mass was that everyone focus on Christ. 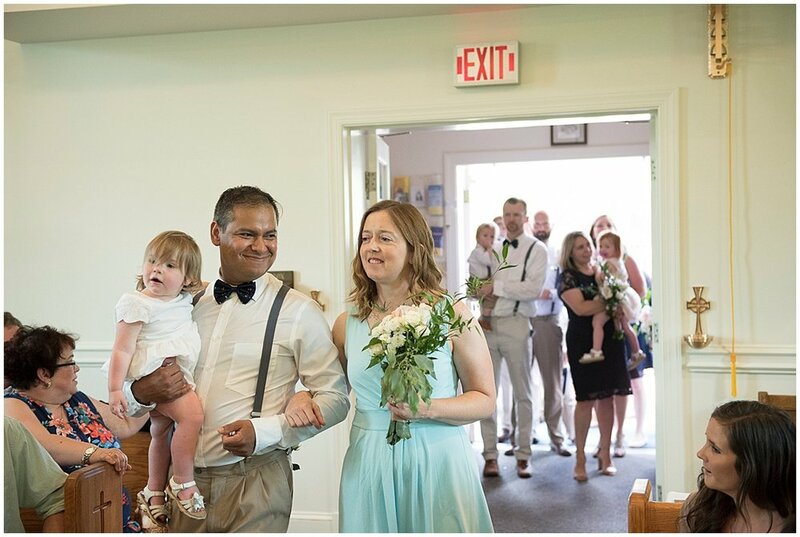 We read the USCCB’s suggested readings and prayed with them a couple months before the wedding, talking about what readings correlated with the journey God had led us on and asking him what Scripture message our guests should hear at our wedding Mass. Our first reading, Tobit 8:4-8, is Tobit and his wife Sarah’s prayer on their wedding night, begging God’s mercy upon them and their marriage. We identified with this throughout our journey and desired this to be the prayer of the Mass: that we would all ask God’s mercy upon us and seek his help in living out our vocation calls. The second reading was 1 John 4:7-12, “this is how God showed his love among us: he sent his only Son into the world that we might live through him.” Our relationship with Christ was paramount to everything; without strong personal relationships with him, without his love transforming our hearts, there would have been no wedding day for us. Christ worked everything together for our good. Ultimately, this marriage is about Christ. It’s a crazy calling to exemplify his love for his Church to a broken world. Music is an integral part of our prayer. Joseph plays guitar and I love praise and worship music. We picked songs that correlated with the themes in our readings and invited our guests into worship. We kept the decorations in the church simple: flowers on the altar and bouquets for Our Lady and St. Joseph. On the windowsills of the chapel, we placed pictures of our patron saints as a prayer of intercession. 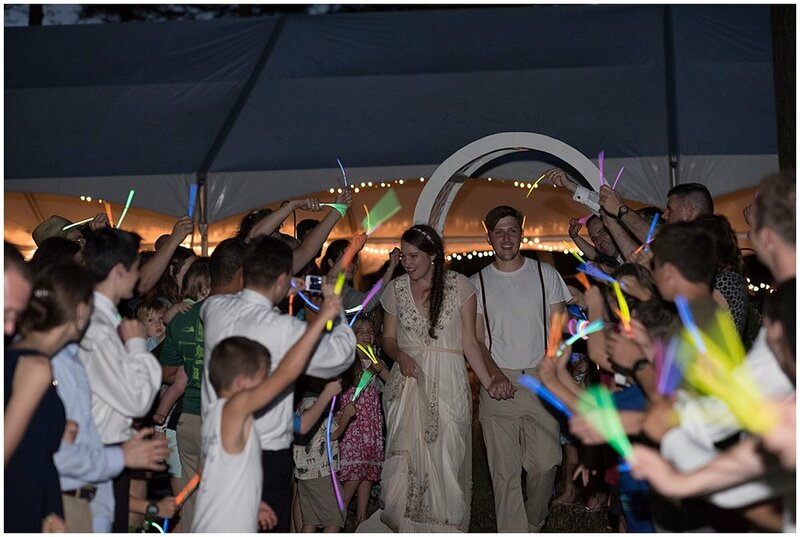 Our hope for the reception was that it feel like a giant family reunion. Both of us have large extended families, so when it came time to discuss our budget and priorities, our focus was on celebrating with as many of our family members and friends as possible. In our rough estimation, we had about 100 kids between ages of 0 and 12 in attendance! We were blessed to hold an outdoor reception at Joe’s family home overlooking the Chesapeake Bay. 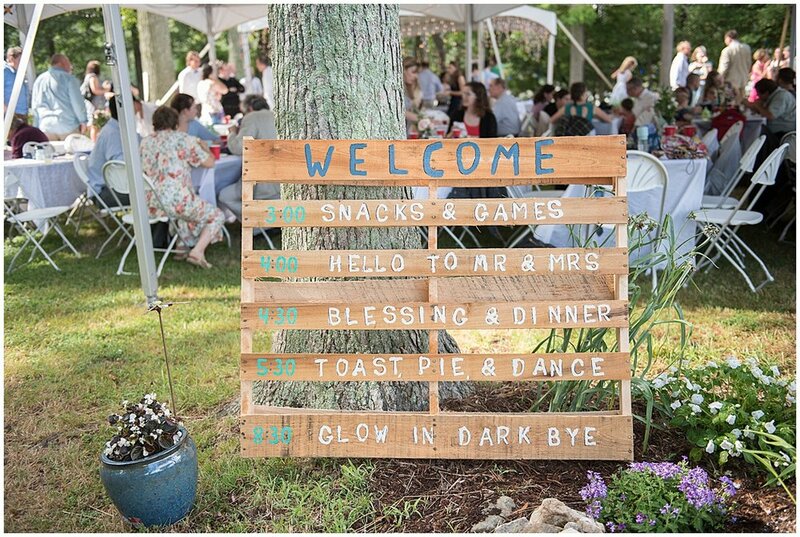 The reception preparation involved lots of precious time with our families: Joe’s family focused on getting the yard ready for the rehearsal dinner and reception, and my mother had us taste test different parts of the meal. 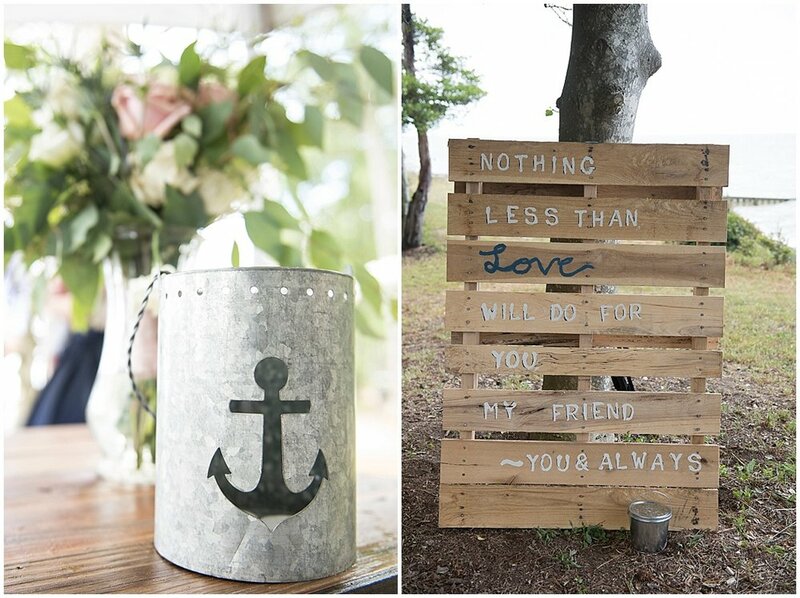 My sisters helped me paint decorative pallets, took care of little details like a Jenga block set for our guestbook, and together we arranged our bouquets the morning of the wedding. We had a large open tent with plenty of dancing space. We served tacos, chips, white queso and salsa dips with beer, water, lemonade, and sangria. 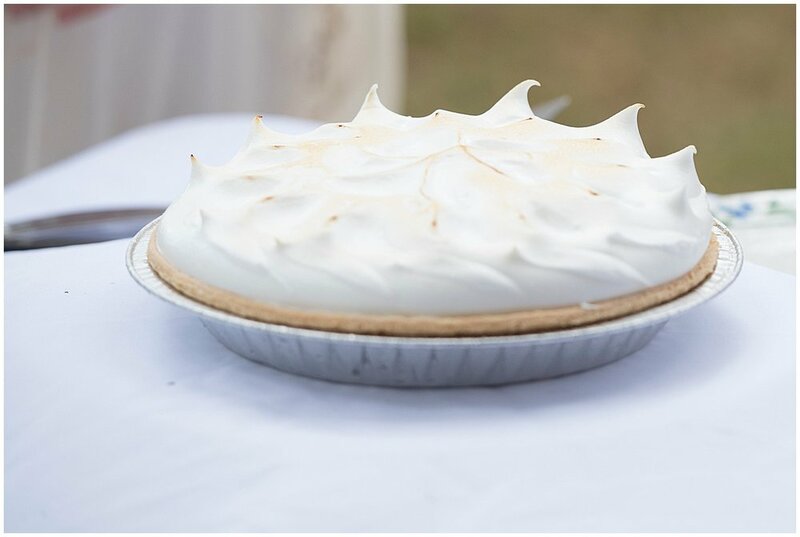 For desert, there was delicious key lime and lemon meringue pies. No one went away hungry--afterward, no pie or tacos were left! 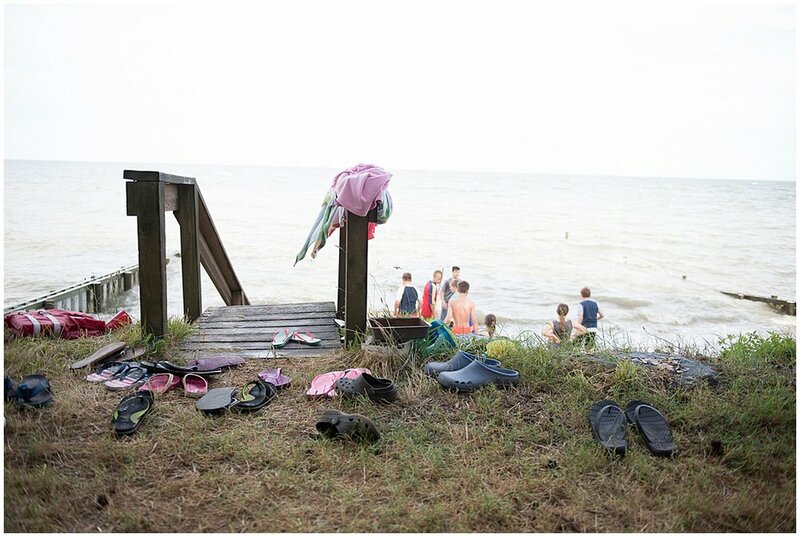 We set out yard games, but looking back, people were more interested in visiting with each other, dancing, and watching the little ones play in the Bay. The younger party guests played in the water until dusk, then crowded the dance floor with glow sticks. The morning of the wedding, Joe and I met up on a dock to pray over our wedding day and upcoming marriage. It really centered us in the grace of the sacrament we were about to receive! Matt Maher’s song “Instrument” played as I drove to get ready. The refrain stuck in my head throughout the day: to the Father and the Son / and the Holy Spirit, three in One / I offer you myself, though I’m broken and spent. / Let me be your instrument. I offer you myself. Those words sum up the beauty of marriage’s grace and love. I offer myself to my husband; I offer myself to my God. We offer ourselves to God. Our wedding day was so peaceful because of those words whispering over in my heart. Peace overflowed in joyful gratitude for God having offered us himself in our journey to the altar, and continually teaching us how to offer ourselves and our love each other. 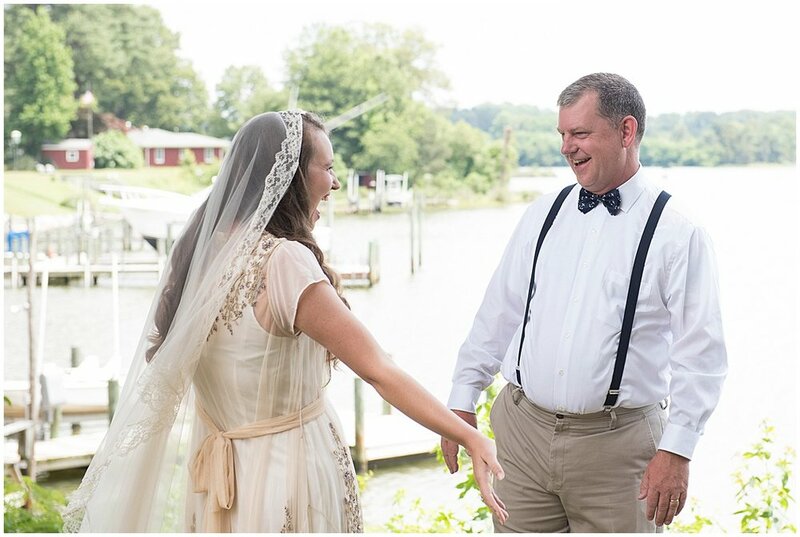 Photography: DG Photography | Church: St. Francis de Sales, Kilmarnock VA | Wedding Reception Venue : Family Home, Reedville VA | Bride Dress: BHLDN | Veil: Family Heirloom | Bride shoes: Target through Poshmark | Headpiece: Burlington Coat Factory | Hair- Pins and Curls | Make-up-Sister of Bride | Groom’s Attire- Brooks Brothers, Van Heusen, and Procuffs | Groom and Groomsmen’s bowties and suspenders: Etsy shop crystalAmour | Wedding band for Bride: Zales | Engagement ring and wedding band for Groom: Ross’s Rings and Things | Wedding Flowers: Norfolk Whole Sale Florist | Catering- Clare West and co. Invitations- @solivaganartist, Rentals: Clement’s Party Rentals.